While the days are longer and people are always looking for something fun to do with friends, festivals are a must-have on your summer bucket list. Sure, we all love a great playlist to listen to as we’re driving at sunset to meet friends for drinks, but nothing beats seeing those same artists play to a crowd of thousands. This year, Lollapalooza was back and better than ever to celebrate some of music's biggest artists and bring music lovers from all over the world together. Grant Park transformed into a destination festival from August 2nd to 5th and was easily my favorite experience thus far. Lollapalooza was more than your typical festival. Surrounded by the robust city of Chicago, visitors and residents had the opportunity to trade off time enjoying music and good eats with exploring the city and finding the best of what Chicago has to offer. Originally created by Perry Farrell of Jane’s Addiction as a farewell tour in 1991, Lollapalooza traveled across North America up until 1997. After it’s revival in 2003, the festival took another shot at a cross-country tour, but it was soon decided to lean into a weekend format where people from across the country would travel to the festival instead. Ten plus years later and Lollapalooza has seen thousands of artists such as Red Hot Chili Peppers, Radiohead, Nine Inch Nails, and Coldplay play their well-known stages only to set precedence for those to come. Lollapalooza 2018 was like no other. With a perfect balance between well-known and upcoming artists, the weekend was spent having the time of my life reliving old favorites and finding new music obsessions that will freshen up my playlist, which has otherwise gotten a little old. To kick-off the festival, crowds were able to enjoy The Wombats, Billie Eilish, and Khalid along with several other artists before it was time to choose the headliner for the night. While Travis Scott played the Bud Light Stage, Arctic Monkeys were headlining the Grant Park Stage, playing songs from their newest release, Tranquility Base Hotel & Casino, along with longtime favorites like “Do I Wanna Know?”, “R U Mine?”, and “505”. On Friday, the American Eagle Stage showcased a wide variety of artists, some of which being LAUV, Greta Van Fleet, and Brockhampton. 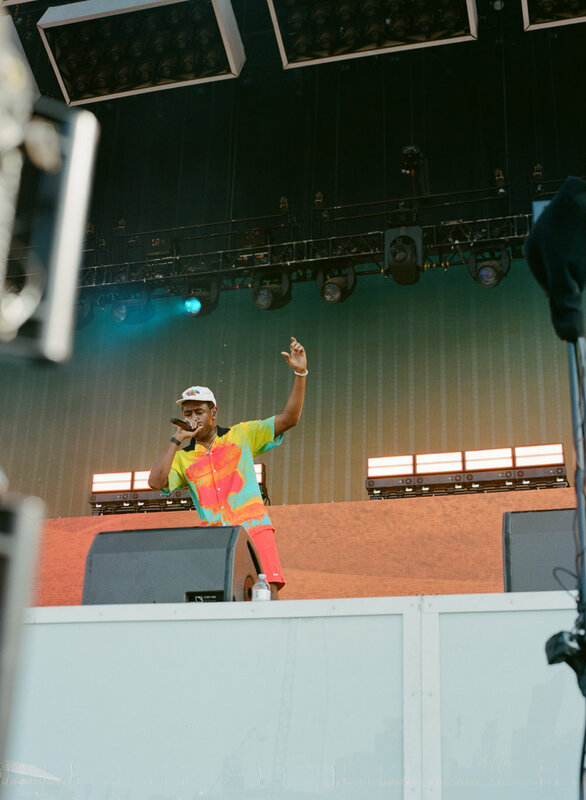 During the day, people moved in waves between stages as Post Malone and Tyler, The Creator drew the largest crowds. Just before sunset, Walk The Moon warmed up the crowd with “Anna Sun” and “Shut Up And Dance” as people waited for their main act of the night, Bruno Mars. While the Grant Park stage was lit up with Versace and 24k gold, The National presented the Bud Light Stage with their incredible stage production that perfectly complimented the Chicago night skyline. Both the hottest and heftiest day that weekend, Saturday was jam-packed with talent. Wallows, Sir Sly, and a personal favorite, Yungblud, were all up dancing with the early crowds. As the day progressed, some of pop’s favorite women Daya, Carly Rae Jepsen, and Dua Lipa all held down the fort at the Lake Shore Stage. That night’s choices for headliners were Vampire Weekend, Zedd, and The Weeknd. Perry’s was the most hopping stage the entire weekend, showcasing all of the EDM talents. Crowds doused in glitter gathered all day long at the stage, basking in the summer heat. Zedd finished off the night playing classics such as “Beautiful Now” and “Clarity”, but added his newest single “Happy Now” and a few other surprises. Sunday was the perfect way to wrap up an unforgettable weekend. While the BMI Stage was occupied with The Aces and The Wrecks, Tito’s Stage sat off to the side and shared Superorganism and Rainbow Kitten Surprise with festival goers. Other artists who closed out the weekend were Gucci Mane, Portugal the Man, and Jack White. After the last set of the night each day, those not ready to go home just yet traveled to nearby venues for Lollapalooza’s Official 2018 Aftershows. Chicago’s coolest music venues like House of Blues, Metro Chicago, and Bottom Lounge hosted artists such as LANY, GoldLink, Greta Van Fleet, Vampire Weekend. This is only a short taste of the entirety that made the aftershows a must-see addition to a long day. Who wouldn’t want to see their favorite artist twice, or catch the set of the one you missed earlier that day. Aftershows are just another part that makes Lollapalooza such an incredible experience. Lollapalooza brings together a mass of music-loving, like-minded people to create the experience of a lifetime. Days were spent capturing everlasting memories, singing your heart out, and dancing till you could not stand to walk anymore. Lollapalooza is worth any and all sacrifice, so I encourage you to find your way to Chicago in 2019. Check all our Lollapalooza interviews and show coverages here.